One thing that can be a pain when teaching is to find texts that support the curriculum. Below is a breakdown of all the main features of my poetry to make things easier when planning. Certain ones can lend themselves really well to teaching poetical techniques! What If Cinderella Was A Fella? ​Watch the whole story on Youtube. Features: Rhyme, Free Verse, -ly and -ness words. ​Features: Free Verse, Modified Nouns. Features: Free Verse, Modified Nouns. Features: -ing and -ed words. Features: -ness and -ing words. This planning has been created for free use in schools. It is to be used alongside the LoreFinders book written by Blaidh Nemorlith. 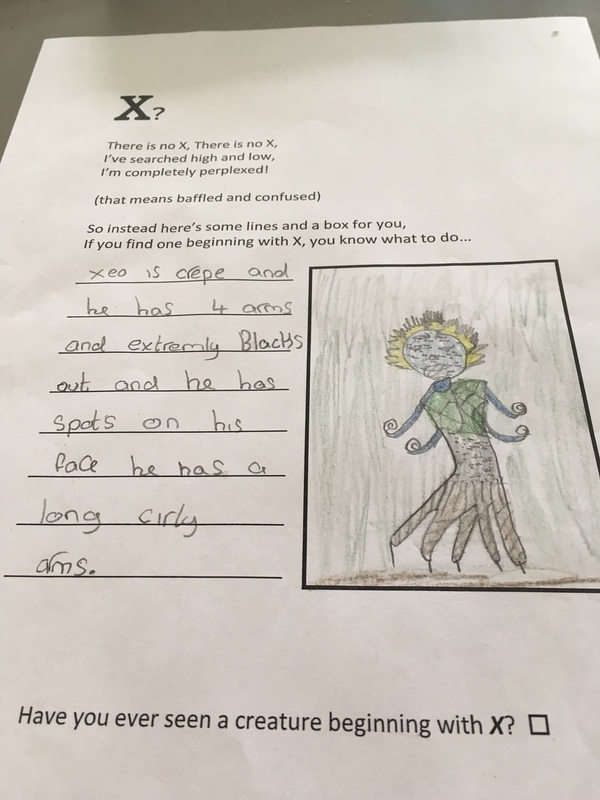 If you do use this for an after school club then please send photos to the author! Discuss the size of the creatures. How big would their tools be? What normal objects could they use as miniature versions? 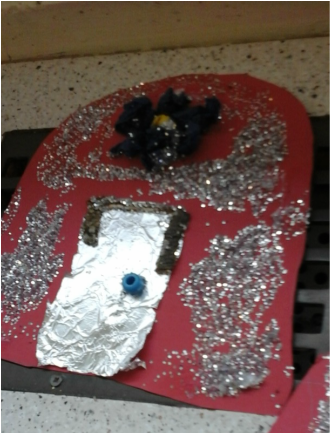 Make fairy doors for the little creatures to use. 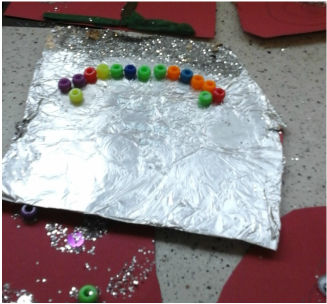 Children draw around an arch template on card. Collect natural fallen materials from outside area and stick onto the door to decorate. Place doors against trees when finished and take photos. Right: Two examples of the doors created by some six and seven year old children. We threw in glitter, foil and beads to the mix for the Knockers. We also pretended to be the creatures and played an adapted version of 'What's the time Mr Wolf' where the children hid as I turned around. The boys in the group loved tapping on tables and other furniture whilst I wasn't looking. Discuss the illustration of Yallery Brown. What is he doing? Tell the children his leaf bed had blown away in the wind and we need to help him by making a new one. Collect leaves or use other materials to make a hammock between two chairs. Children might use PE scarves or netting or string and paper cut out like leaves to make a suitable bed. Test with a toy to see if it holds. Below: A picture of our mock 'Yallery Brown', wonderfully dressed up by my TA. The children used a variety of resources but favoured the scarves to make their hammocks for him. We challenged our building skills further by putting the chairs further and further apart. Was really good fun and interesting to see how the children went about building a bed, some preferring typical hammocks and others being inventive with how they tied the scarves to create a web. Make own Hunky Punks using modelling clay or plasticine. 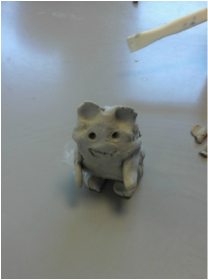 When dry (if using clay) – place them around the school in different places and take pictures. For older children you could attempt a stop motion animation of the Hunky Punk in their location. Below: Three examples of the Hunky Punks we made as a group. The children loved this. 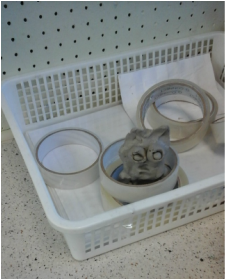 Again we adapted the 'Mr Wolf' game but this time the children had to find something to cling to and make a glaring face staring at me when I turned around. 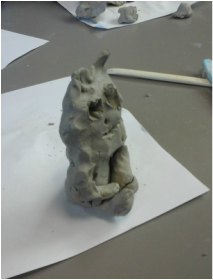 Their clay pieces were fantastic and they enjoyed hiding them around the room and taking pictures of where they had been stuck! Left a bit of a mess but worth it! Discuss the dangers of going close to the water. Do we think the Grindylow is a story that encourages you to be safe? Paint a watercolour of the Grindylow’s face. When dry, place underneath a clear bowl or dish filled with water. Children to look in and see their Grindylow peering back at them from under the water. 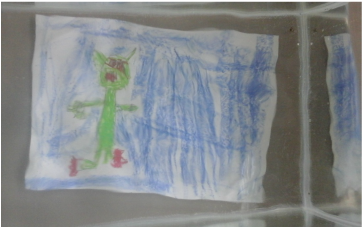 ​Below: Two examples of the Grindylow artwork produced by the children. We split into two groups and some hid under the tables whilst others acted out peering into the water. When they came to close the hiding Grindylows would reach out and grab their ankles. They did not want the game to stop! 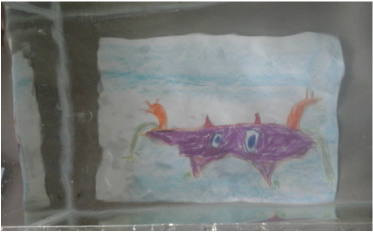 Afterwards we used pastels to make the pictures and then placed them under a fish tank filled with water. The children again leaned in and as they did I flicked the water to splash them! Made a few of them jump and soon enough they were all lining up to have a go! Discuss the Loch Ness Monster and his cousin Morgawr. Have the children ever seen anything bob out of the water that might have been a sea serpent? Make masks of Morgawr using feathers, and other materials. When finished, use a water track to dance to. Can the children move like the sea serpent. Side to side like a snake, or up and down like a whale... etc Perform in pairs or groups and share with each other their movement. 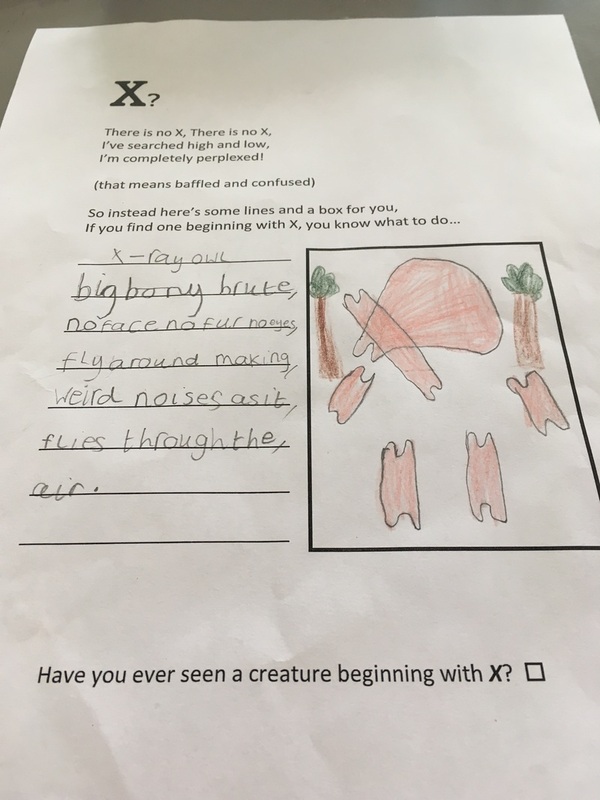 Explain Blaidh cannot find a creature from Britain beginning with X. Ask the children if they know of one. Set challenge of inventing one. 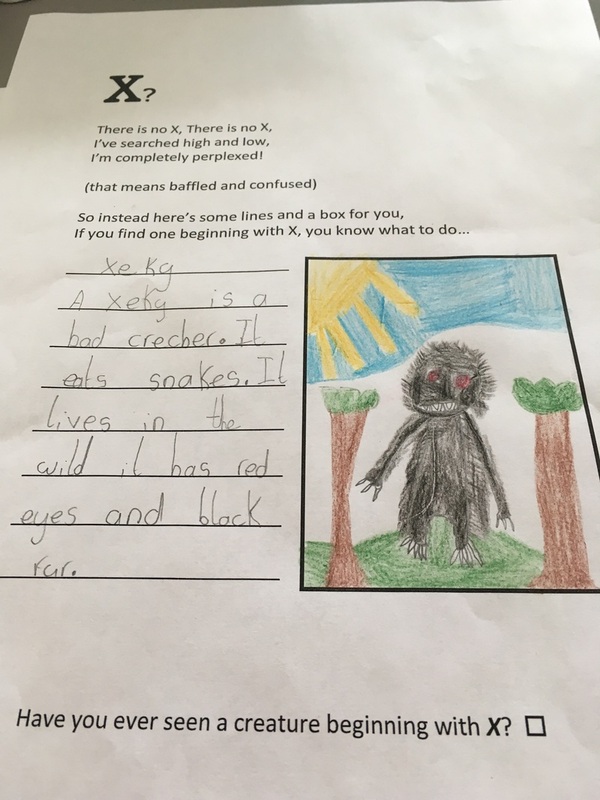 Give children lines and squares of paper to write about their own creature beginning with X. They can submit their designs to Blaidh and the most imaginative will end up on the website. Below: Three examples of the wonderful imaginations that recently created their own characters. The children didn't need any thinking time, they knew exactly what they wanted to do. Some wrote poems, some wrote descriptions but all of them ran along the theme of the Lorefinders book. Great end to the club and we even had time to handout some Lorefinder certificates!